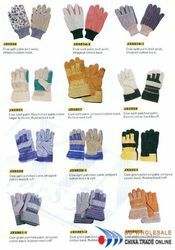 We manufacture a wide variety ofSafety Leather Hand Gloves. These can withstand extremely high temperature without causing any harm to the hands of the human being wearing it. These are used in a variety of industrial applications and chemical industries. These are very widely used in the electrical industry to prevent the workers from electrical shocks. These are superb in the terms of softness to the skin along with breathability of the fabric as well.